A month or so ago Jay Krabbenhoft of Gate City Bank sent items to distribute at random around North Dakota State University’s department of History, Philosophy and Religious Studies. 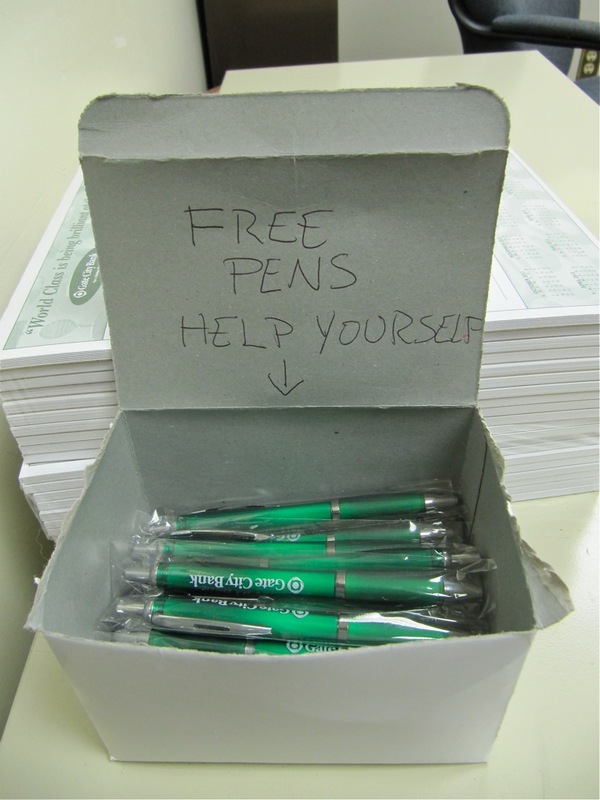 I inscribed a short phrase at the top of a box, “FREE PENS,” all in caps — presumably to draw more attention — and below that a “HELP YOURSELF” with an arrow pointing to said pens. Only after Dr. Dennis Cooley walked by, saw the sign, and said, “Who is ‘Pens’?” did we begin a short discussion on the need for context, provenance, origin, and leaving items in situ. To Cooley (a philosopher of ethics), the sign immediately conjured up in his mind an idea of someone mistakenly or unjustly incarcerated. “‘FREE PENS’ sounds like someone’s last name who is locked up,” said Cooley, more or less. In reality, though, the sign asked visitors to take a pen (since there is a relatively low frequency of office visitors, I have since mandated that visitors leave with no-less than three pens per visit). This in turn got me thinking about how some years ago Dr. Melinda Leach assigned her methods and theory in archaeology and anthropology class to read several American Antiquity essays, specifically those by the late Lewis Binford and the still-chugging Ian Hodder. Both perceived that they have (or had) a completely different way in which they viewed the archaeological record (Binford asserted “Processualism” and Hodder “Post-Processualism”), but the general idea is that artifacts, or material culture, are 1) left within the context in which they are found because this effectively allows the researcher to glean information from the artifacts; and 2) anyone who approaches evidence brings a certain degree of known or unknown cultural baggage and value-judgements to bear on said evidence (David Hume rambled on about this important subject at length in the 18th-century). These two points are demonstrated when individuals engage and interact with any piece of evidence, and it is something archaeologists and historians incessantly talk about and try to communicate to collectors who hold up their collection of material culture and invariably ask, “What do you suppose this is worth?” Archaeologists and historians only know what it is worth in terms of knowledge (aka, Indiana Jones, “This belongs in a museum!”), while collectors tend to put it in bottom-line, Wall Street terms: MONEY (I am not sure, but this either is a reflection of American culture where money is fortunately and unfortunately king; or it is a universal reflection of the human condition, because unless we philosophically check ourselves we invariably gravitate toward perceptions of money which is analogous to power which is analogous to control and perceptions of prestige, fame, and so on and so forth — John Acton is attributed with the phrase, “Power tends to corrupt and absolute power corrupts absolutely.”). This latter theme also deals with context and perception, and it is thrown into relief when looked at more broadly: if something is perceived as valuable, then it is valuable. If a lot of people perceive it as valuable, then that something is going to be more valuable (historically, this was famously represented by tulips in Western Europe). Anyhow, oftentimes branding pens as free induces two responses: an individual either thinks they are not worth much; or philosophers of ethics think you are on some kind of moral ACLU-inspired crusade. Thus the perpetual need for continued dialog that provides context, provenance, and interpretations of origin by leaving items in situ (at least until we can get there, document it, and eventually say, “Pull it!”). This entry was posted on Thursday, December 1st, 2011 at 3:58 pm	and posted in Uncategorized. You can follow any responses to this entry through the RSS 2.0 feed.